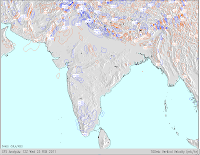 Madhya Maharashtra region on Wednesday, 23rd Feb. Its vortex is seen on the map, and the resultant line of wind discontinuity has formed light clouding from the centre of the Madhya Mah. region straight down to interior Karnataka. Thunder was evident in some areas of Solapur and Pandharpur on Wednesday evening. Resultantly, our rain forecast is advanced, and rain/thundershowers are now expected in pockets in regions of Marathwada and Madhya Mah. from tomorrow evening itself. Maybe for a couple of days. 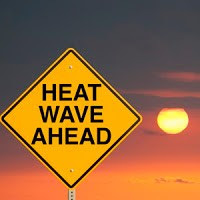 With a partial cloud cover on Thursday/Friday, Mumbai should not exceed 32c in the day. Nights will be a bit warmer rising to 21c. F4 is precipitating rain/snow in its own way over the Northern states of Kashmir, H.P. and Utteranchal on Wednesday, albiet in a lesser strength. Should sweep away eastwards and diminish in a day or two, making way for F5 ! Lows have been persistently below zero F (-18C) in the far eastern cities of Europe with lows falling to a cold as 20 below zero (-29C) in Helsinki. The cold has been very impressive in this part of the world the past two weeks.. Details to come shortly!...and many more details on Mark's Blog.